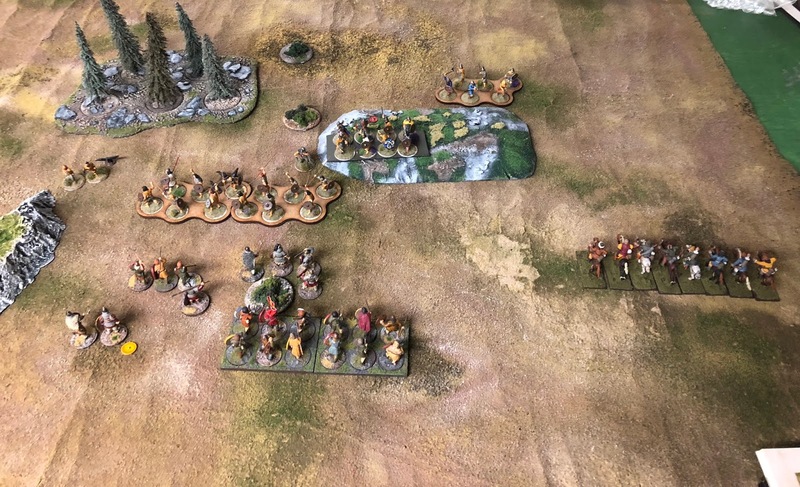 Myself and Adam had another game of SAGA last Thursday. The game went much smoother than our last and I believe we are finally getting a good grasp of the subtle rules changes from version 1 to version 2. 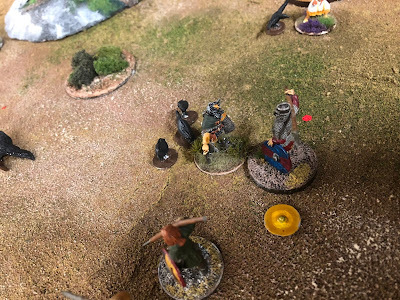 We took another scenario from More Saga Battles, this time we played Into the Slaughter. You can download the scenario here. Essentially it is a scenario that you can win only by killing the enemy Warlord or forcing him off the centre part of the terrain. Adam decided to go with a 6 point Norse-Gael Warband while I stayed with my trusty Vikings. I did however go with a very novel composition for me. Basic layout with Vikings in foreground. 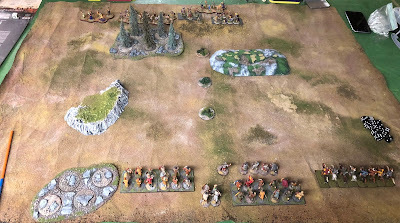 The 3 patches of bushes running vertically in the centre are the markers with which the Warlords need to stay within M. My plan is to assault with my javelin armed levies being supported by my warlord in the centre with a unit of hearthguard as bodyguards. 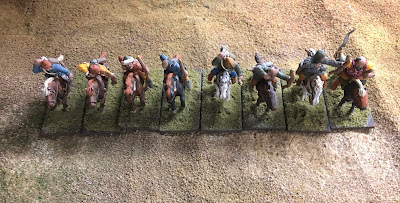 I kept my mercenaries to my right as a harrying force, they can move 3M in a single move which makes them useful in this support role. 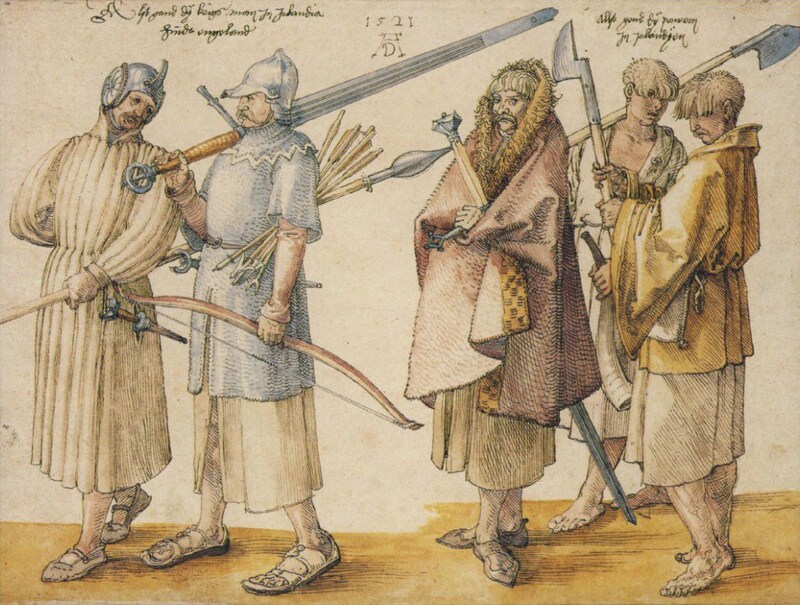 More crazed Norse-Gaels. 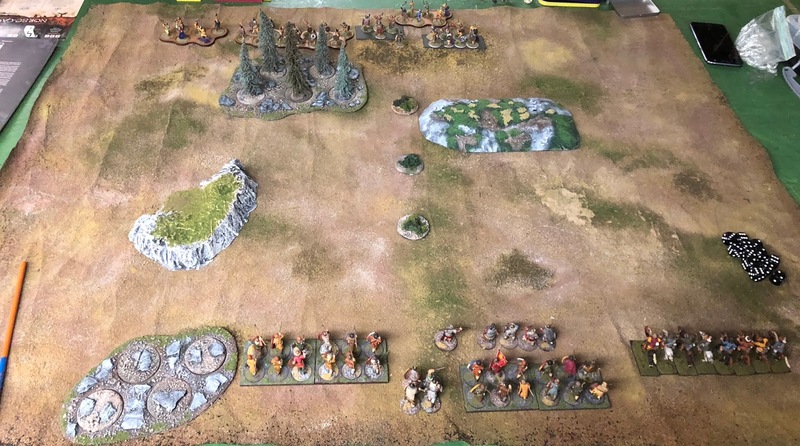 They have a very interesting Battleboard which I felt was going to be quite a challenge. Good old Ragnar, gives Determination to all troops with S, Resilence of 2 and generates 2 SAGA die. 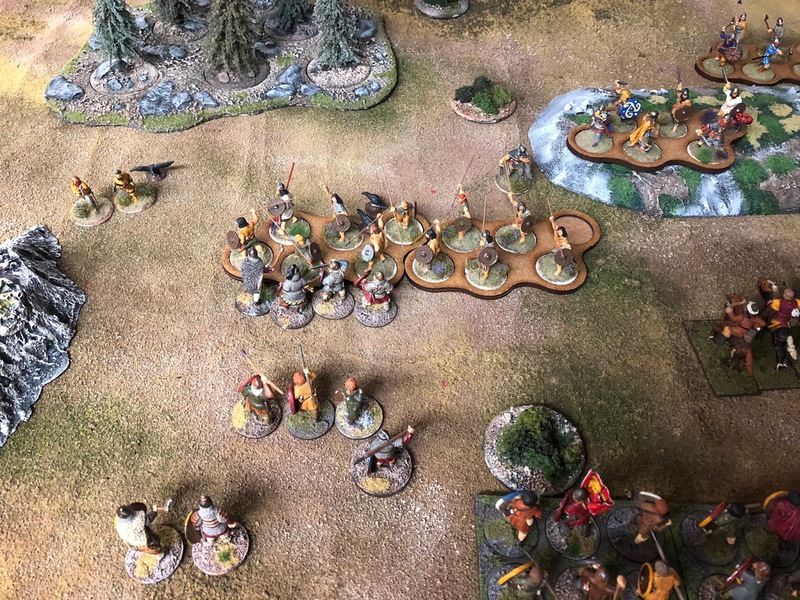 My initial plan went well and I was able to take out a Hearthguard unit with my suicidal levy with a good utilazation of 3 Viking BB abilities. It could have gone a little better as I lost 8 levy thus losing a SAGA dice. 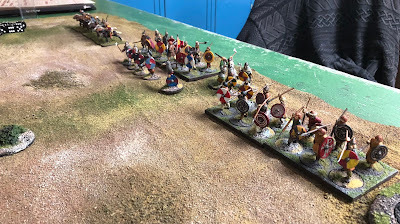 In a second follow up assault with my Hearthguard I further weakened the Norse-Gaels but lost 2 Hearthguard, as you can see both the left flank units withdraw letting the right flank followup. 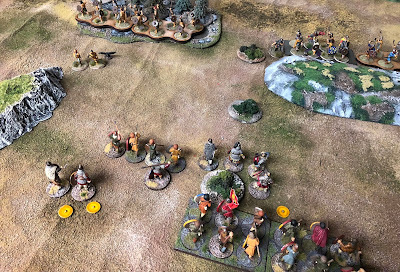 Adam advances his javelin armed warriors as I send in my mercenaries to keep the Norse-Gaels on the hill out of the battle. I take out the Warriors but the battle is costly and I lose my Hearthguard unit. I still have a good advantage in SAGA dice though, I believe Adam is now down to 3, while I still have 5. 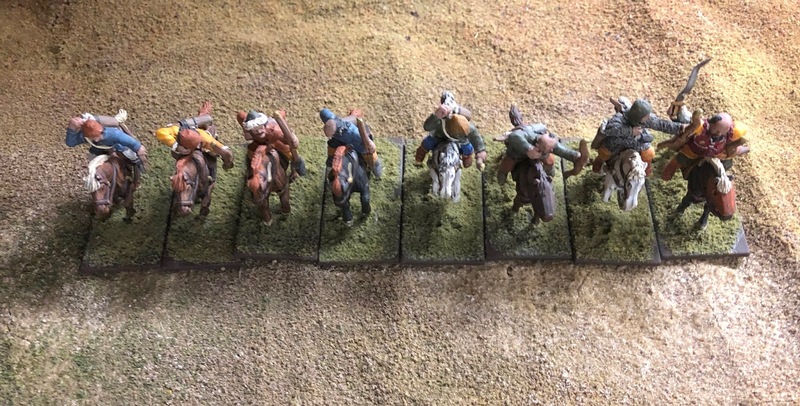 Adam sends in a hearthguard unit to support his Warlord. I still have a 2 man hearthguard unit which I now send in to attack his Warlord. This works out well as I again use stacked SAGA BB abilities I am able to score many hits and take out all but one of his Hearthguard (they drop like flies as bodyguards) and exhaust his Warlord. 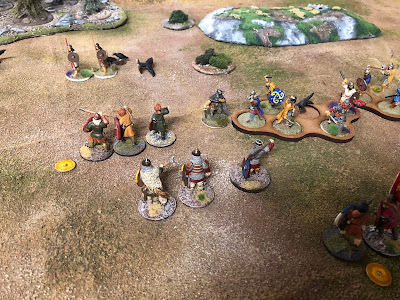 I send in Ragnar to finish off the Norse-Gael warlord but I have exhausted all my BB abilities and go in with just 8 Attack dice, it should be enough but Adam has reserved several BB abilities which make me nervous. I decide to start to take down his fatigue to increase the probability of my hits suceeding. 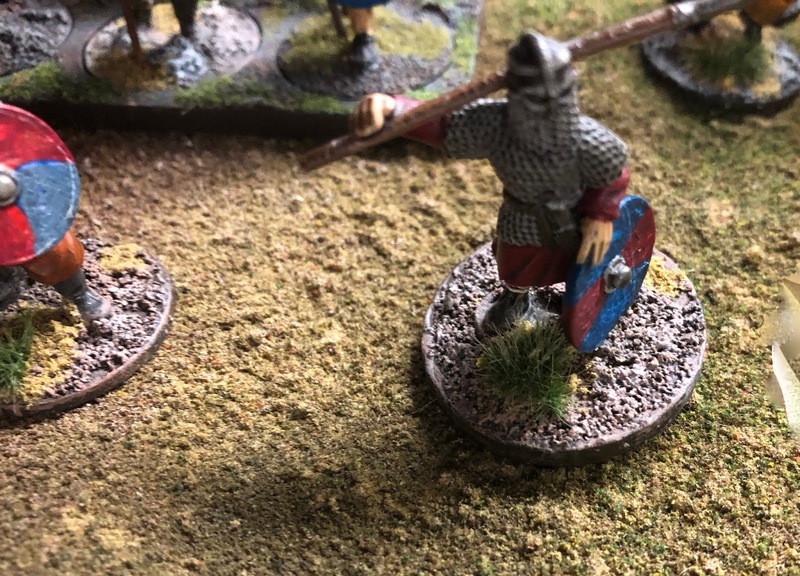 I shuld never have done this as I need just one hit to get through and by taking down his fatigue I not only give him back his Resilience but also allow him to rapidly increase his Attack dice through the Norse-Gael combat pool. He is now throwing I think 14 die, melee takes place and we both die. A draw! It was a good game, unfortunately I blew the last battle, should never have removed the Norse-Gael Warlord's fatigue, by doing so I gave him innumerable Attack die as well as restoring his Resilience. I will know better the next time. In respect to the scenario, it was not as good as the last one from MSB, we could have easily went on for hours as there was no turn limits or slaughtering points. The only way one could win is my killing the Warlord and it would have been very easy to play defensively. Clearly we decided not to! An epic tale worthy of a bard or two to recount the saga!